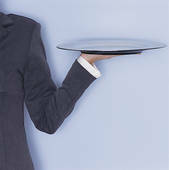 We all like to be served well. There is no mistake about that statement across the board. The feeling that you get from going into an establishment of any kind and being greeted properly and then served properly on top of that is always golden for the soul. I have relationships with many people in this great city and I am proud to say that I feed them all of the time in an authentic fashion. Have you ever been somewhere that had service so great that it shocked you? I bet you have, I also bet that you can tell me where it was and what you purchased as well. My father asked me today if I had ever stayed at The Ritz Carlton and I told him yes. He asked me how was my experience and I answered, "flawless." I was not prepared for that question, however, I was prepared with answer. They knocked it out of the park!! They were courteous, kind, dressed impeccably, and extremely genuine at that! He had the same experience. So I ask you, "Was it because of the price of the room or the decision that the management made a long time ago to create an atmosphere that was second to none for every single person that stepped through the doors?" There is a cleaners that I frequent on the lower east side in New York. I know every worker in the place and they all know me. How did this happen? I treat them with such respect every time that I see them and they return it each and every time as well. We laugh and we joke and we just make the most of our 3 to 5 minutes that we see each other every time. Some people expect to receive the best service even though they offer nothing of themselves in return. When we offer ourselves in a pleasant fashion, there is no guarantee that we will get it in return. The magic though, is that when we offer our pleasantries, we are showing the other person that they matter or that they are appreciated and that has the power to move mountains over time. I had lunch at a wonderful restaurant some time ago and I arrived at a slow point in the afternoon. The owner's girlfriend was there and she smiled at me greeted me and asked me where I had been for so long? We spoke and then she came and sat with me. The conversation was just perfect. We spoke for a good 20 minutes. At the end of the meal, she asked if I would like to try a dessert, but I was stuffed. I declined and asked for the check and she brought it promptly. I opened it, and it said, "This one's on me, thanks for the great conversation!" I could not speak with her or thank her because she had to run out to the store right after that. I left her a tip and then I had to get to an appointment. Service is just like a tree. We plant the seeds and then it grows because we water it. When you are served well, chances are you will serve others well. This is not a perfect science, however, I challenge you to put it into play for a month and see what happens. I have a fetish for service and I am not afraid to admit it.